-Sequestering additive chemical decreases the formation of H2SO4 resulting from the reaction of H2S with “wet” crude oil in pipelines and storage tanks/tankers. 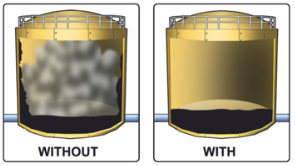 The sulfur in the H2S bound molecularly and encapsulated in the “wet” crude oil can resist removal. Sulfur may be present in crude oil as elemental sulfur or as H2S compounds (e.g. mercaptans, sulfides, disulfides, thiophenes, etc.). Sulfur in crude oil can range from 0.2% to 2.3 % by volume for API 24 to 40 commonly produced today. H2S can range from below 10 ppm which is acceptable to above 20 ppm which is a serious safety hazard. H2SO4 can eat through pipeline and storage tanks/tankers, and if breathed is poisonous. H2SO4 presents significant HSE issues. Profits from crude oil production, flow stream delivery and refining can be adversely impacted by increased costs due to the presence of H2SO4. OilFlux™ “SH2” sequestering additive chemical successfully decreases the reaction of H2S formation of H2SO4.